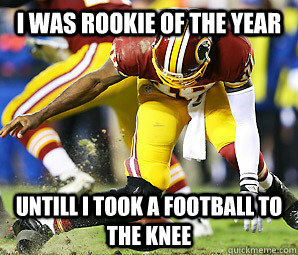 The RG3 Saga, When Will It End? He would go on to win the offensive ROY award in 2012 and that was about the last time he looked anywhere close to the player he was in college. In both 2013 and 2014 Griffin went down with knee injuries sidelining him for large chunks of the season. This in turn made everyone question his ability and toughness. You see he wasn't playing with the reckless abandonment that he did in his rookie season, but that made sense he was trying to prevent more injuries. The issue most people had was that he wasn't making simple throws or staying in the pocket and then would blame others. Jump to now with only two weeks left before the NFL season kicks off RG3 is again a headline story, for similar reasons. He's making comments about being the best QB and putting blame on his O-line for not giving him enough time to prove that fact. RG3 is by no means a locker room leader as much as he may think he is. Instead he is one of those guys that acts like a three year old trying to get his parents attention to show them how awesome he can go down a slide. Throwing your teammates under the bus is nothing a leader would ever do Brady, Manning, or Rodgers goes around bosting about how great they are or throwing guys under the bus when the team struggles. Instead, they take the blame talk about improving themselves to make everyone else better. RG3 hasn't done that and if he doesn't soon and start playing like the QB we all remember from his rookie season then he may be the next guy added to the all time bust list. If anything at least Michigan State fans would get to see Kirk Cousins play some more, but that's just my stance.